Now Foods Thyroid Energy is a dietary supplement that contains vitamins, minerals and plant extracts and supports the thyroid gland functioning. This product contains L-tyrosine, selenium, zinc, iodine, copper, B vitamins (methylcobalamin, folate and vitamin B6) and also standardized extracts from Ashwagandha root and Guggul resin. The product is GMP (good manufacturing practice) certified. It is suitable for vegans and vegetarians. The packaging contains 90 veggie capsules. Iodine is one of the most important micronutrients necessary for the proper functioning of the thyroid gland. In the body iodine ions are oxidized to free iodine needed for tyrosine iodination. In iodine deficiency the optimal thyroid hormones synthesis is impossible, so it is necessary to ensure the proper supply of this element. It should be remembered that excess iodine is not recommended in Hashimoto's disease. Selenium is a micronutrient forming the so-called selenium-dependent enzymes, including deiodinase involved in the conversion of T4 to active T3. An optimal level of iodine is necessary for the correct performance of selenium. In the thyroid gland the selenium concentration is the highest. Selenium is a part of glutathione peroxidase, an enzyme with strong antioxidant activity protecting the thyroid against free radicals that may induce oxidative damage to this organ. One of the studies has proved that selenium supplementation by people suffering from Hashimoto's disease caused an increase in FT3 to FT4 ratio and a decrease in aPTO antibody level. Zinc and copper are microelements present in superoxide dismutase, an enzyme responsible for the neutralization of superoxide free radicals and singlet oxygen that strengthens the body's antioxidant barrier. It has been proved that lowering zinc level in the body causes an increase in the antithyroid antibodies concentration. Zinc is also an element of the T3 receptor proteins necessary for its binding. Zinc deficiency causes slowing down the metabolic rate of hormones. Zinc positively influences thyroid function. Due to the antagonistic activity of zinc and copper, they should be taken together to avoid deficiencies. Vitamin B12, folate and vitamin B6 are essential for the proper nervous system functioning and optimal energy metabolism. The deficiency of vitamin B12 and folates resulting in development of megaloblastic anaemia. It is an autoimmune disorder quite often associated with Hashimoto's disease, which is also autoimmune. All these vitamins lower homocysteine levels. Hyperhomocysteinemia is a condition caused by coexistence of hypothyroidism and deficiency of the above-mentioned vitamins. Too high level of homocysteine causes risk for thrombotic changes, atherosclerosis and stroke. Ashwagandha (Withania somnifera), is an Ayurvedic plant with adaptogenic properties. The active compounds contained in the raw material affect the body's resistance to stress factors and reduce cortisol levels. That improves the well-being and sleep quality, increases emotional stability and improves mental processes. Ashwagandha influences the thyroid gland. It stimulates the production of T4, and combined with the guggul resin it increases the production of T3. Indian bdellium-tree (Commiphora mukul) is a flowering plant and its resin - guggul - is a well-known raw material used in Ayurvedic medicine. It presents anti-inflammatory and antiseptic properties and lowers cholesterol level in the blood. Active compounds of the raw material (gulgusterons) have affect thyroid hormones. In an animal study gulgusterone Z caused an greater iodine uptake and an increased thyroid metabolism. 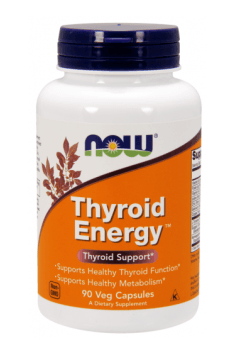 Now Foods Thyroid Energy is a valuable dietary supplement that provides the necessary ingredients used to produce thyroid hormones, and supports the functioning of this organ. It should be remembered that the basis for the hypothyroidism treatment should be pharmacological. This supplement can effectively support and complement the therapy. This product is recommended as a prevention of thyroid diseases and as an alternative in hypothyroidism and Hashimoto's disease, but only after consulting a doctor. An important element that supplements the therapy in hypothyroidism is a proper diet. It should be based on high-quality polyunsaturated omega-3 fatty acids, low glycaemic index carbohydrates and products containing wholesome protein. A high dose of new generation vitamin C PureWay-C®.